My Latin American tours usually start in this order: (1) Ride out of the airport. (2) Find food and water. (3) Buy a machete. (4) Find somewhere to spend the night. If they sold machetes at airports, it would probably be number one. In fact, if it didn’t raise so many eyebrows at airports, I’d buy one before I left home. Every so often, I meet a busybody gringo who doesn’t like seeing a machete strapped to my bike. It frightens them because they think it’s a weapon. But a machete is no more a weapon than is a pool cue, tire iron, frying pan, or any other tool misused for violence (think of Joe Pesci’s pen-stabbing scene in Casino). The point is, machetes are useful. 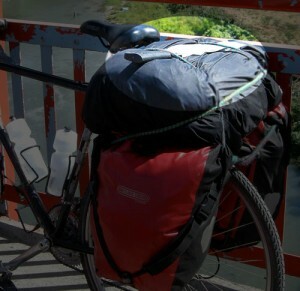 When I’m touring Latin America’s back roads, I find them as useful as bungee cords, duct tape, or a multi-tool. 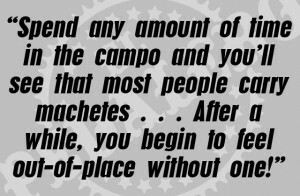 Spend any amount of time in the campo and you’ll see that most people carry machetes, everyone from ten-year-old boys to seventy-year-old women. After a while, you begin to feel out-of-place without one! So, what can you use a machete for on a bike tour? • Clearing a camp spot in forest undergrowth. This, alone, is a good enough reason to carry one. • Cutting a trail into thick jungle, away from the road. Sometimes, it’s the only place to pitch a tent. • Opening a coconut. It’s also useful for reaching up and knocking down this nutritious, abundant food. • Chopping firewood in areas where it’s appropriate. This can save your life in cold, remote places. • Making replacement tent poles from branches. Tour long enough and you’ll break a pole. • Poking under the tent in the morning to check for snakes, scorpions, etc. On a rainy night, your tent can create an attractive dry spot for local fauna. Check first before pulling out tent pegs in the morning. • Fending off wild dogs. Or poisonous snakes, or other dangerous animals. • Hunting. I’ve never had to hunt on a tour, but If I’m starving I’ll do whatever it takes to survive. OK, there’s one more use for a machete on a bike tour . . . In rural areas, I bungee the machete to the top of my pack for convenience (photo). In the city, I sandwich it between the panniers and pack; out of view, but still quick to grab. It’s true, sometimes machetes are used in robberies against foreigners. Really, they’re used only to frighten. Actual machete attacks on tourists resulting in injury or death are virtually unheard of. But travellers love to obsess about it, even though they’ve got a better chance of being hit by a car. Three men once tried to mug me at machete point in Guatemala, but I scared them away by picking up rocks and showing I was more prepared to fight than they were. I didn’t even need to pull out my machete. But I admit, it’s nice to know it’s there, sometimes. The sense of security a machete provides is probably false, but as I’ve explained, it’s not supposed to be a weapon anyway. It’s a tool. One final word about machetes. Keep them sharp! Swinging a blunt machete at undergrowth can cause it to bounce or slip and result in serious injury. When you go to the hardware store to buy your machete, get them to sharpen it for you and make sure you always keep it in its sheath. 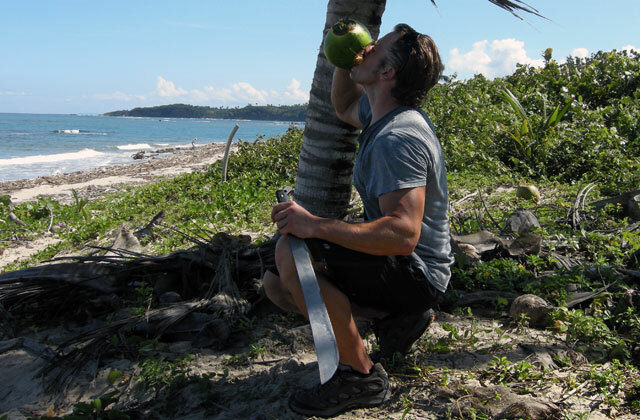 Feature image (top of page): Enjoying a freshly-machete’ed coconut in the Dominican Republic. Ok, you’ve convinced me to put the machete on the list. I’ve been meaning to get one ever since we got to Mexico and still haven’t bothered. Now that we’re in Colombia, it is time. Awesome! Keep it sharp, amigo! exactly! i biked from Santa Barbara Ca. to San Francisco Ca. and took a machete with me for fire reasons and sometimes i would have to explain to other cyclists i had met recently at campgrounds not to be nervous and not to get scare… that i had brought it with me just to chop branches to start fires along my trip… it was just fun to see their faces… but fur sure i’ll take one on my way down to costa rica… the only thing is that i will have to leave one and get a new one at every border… i’ll be reading your blog man to keep getting inspired! safe travels! 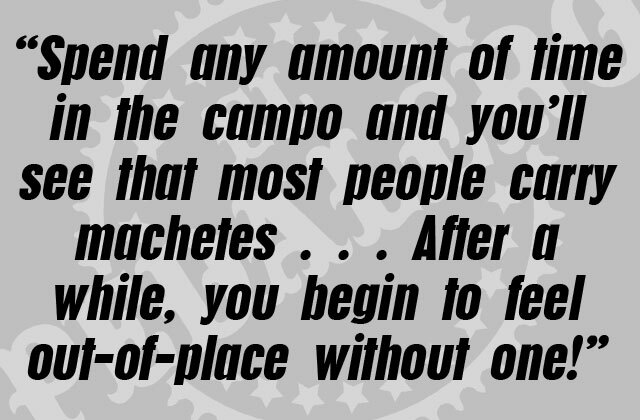 Yes, other adventure cyclists understand the whole machete thing. It only looks like a weapon in Canada, US, UK, Europe, etc. Everywhere else, it’s just a useful tool! Drop me a line when you’re in Central America. I’ll be down that way this winter. Maybe we can ride a section together if we’re in the same area. Thanks for the support, hermano! P.S. You won’t have to buy a new machete at every border. At least, I’ve never had to yet!